Places are still available for the History from Elsewhere Symposium to be held at London Metropolitan Archives tomorrow (Friday 18th September). We are very pleased to be presenting a paper on our civic engagement project associated with the Refugee Archives at UEL and the the launch of our Living Refugee Archive. We are proud to announce a two-day international symposium, to be held at the VU University in Amsterdam, organized by the research group Identities, Diversity, and Inclusion of the Sociology Department, in collaboration with the Research Committee 38 ‘Biography & Society’ of the International Sociological Association. 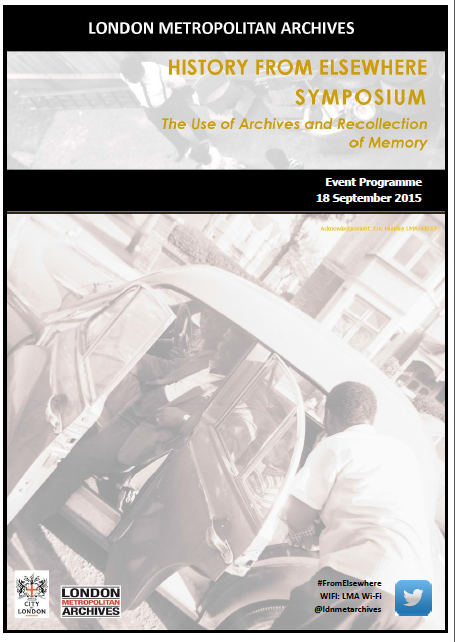 The focus of the symposium is on the experience and narratives of belonging and what it means in people’s lives. Where and when do they feel ‘at home’ and how has this experience changed in the course of their lives? What kinds of ‘spaces’ (e.g. cultural, geographical, imaginary) engender a sense of belonging and which do not? What are the features of contexts which are conducive to the people feeling that they ‘belong’? What stories do they tell about feeling ‘at home’ or ‘not at home’ and how can these stories help us to understand the social parameters of conditions of inclusion and exclusion? Which niches for social change can be found in people’s everyday experiences of belonging and not belonging? We are also particularly interested in addressing methodological questions which arise in studying biographies of belonging: for example, how can we investigate belonging as an embodied, sensual, affective experience? What does belonging (or not belonging) actually ‘feel’ like? What kinds of interactional practices produce, facilitate or undermine an experience of belonging? What do people do in order to ‘include’ or ‘exclude’ others in a particular setting? How do individuals make sense of processes of inclusion or exclusion? What kinds of discourses and cultural narratives are available for talking about exclusion and inclusion? Please find the detailed programme in attachment and feel free to circulate. You are all warmly invited to attend. In light of the findings of recent research project ‘Welfare Reforms and Their Impacts on Refugee Families Living in London’, this symposium will bring together academics, policy makers, practitioners and local activists to explore and debate the ways in which the current economic crisis and austerity measures are impacting on new refugee families in the United Kingdom. Recent changes to the welfare system have made welfare more inaccessible and exclusionary, leaving many refugee families without sufficient support to meet their basic living needs. Presenters will explore welfare reform’s implications for refugee families and examine grassroots efforts to mitigate the effects of austerity on migrant groups. Participants will be invited to consider what role third sector organisations can play in responding to austerity and how these agencies can be supported in their work with refugees and their families. Dr. Leah Bassel is a New Blood Lecturer in Sociology at the University of Leicester. Her research interests include the political sociology of gender, migration, race and citizenship and intersectionality. She is the author of ‘Refugee Women: Beyond Gender versus Culture’ (2012) and her work has also been published in journals including Politics & Gender, Ethnicities, Government and Opposition, French Politics. She is an Assistant Editor of the journal of Citizenship Studies. Dr. Akwugo Emejulu is a Lecturer at the Moray House School of Education, University of Edinburgh and a Co-Director of the Centre for Education for Racial Equality in Scotland. Her primary research interests are in two areas: investigating racial and gender inequalities in a comparative perspective and exploring the dynamics of social welfare political mobilisations in Europe and America. Her monograph, ‘Community Development as Micropolitics: Comparing Theories, Policies and Politics in America and Britain’ will be published by Policy Press in 2015. Ms Indira Kartallozi is Director of Chrysalis Family Futures, a social enterprise working in collaboration with charities and agencies to provide intensive support services to vulnerable families and children. Indira has 15 years experience as a senior advice worker on welfare rights, housing and immigration for homeless families, migrants, refugees and asylum seekers. In 2012-13 Indira did a MA in Refugee Studies at the School of Law and Social Sciences, University of East London. The ‘Welfare Reforms and Their Impacts on Refugee Families Living in London’ project was her MA Dissertation research, which she successfully completed in September 2013. Originally from Kosova, Indira arrived as a refugee in the UK in 1992. Dr. Hilary Sommerlad is Professor of Law, Centre for Professional Legal Education and Research (CEPLER) at the University of Birmingham. She is Articles Editor of Legal Ethics, serves on the editorial boards of the Journal of Law and Society and the International Journal of the Legal Profession, and is a member of several international research groups. She practised as a legal aid lawyer, and this experience is reflected in her research interests; these include the cultural practices of the professional workplace, diversity in the legal profession, and legal aid and access to justice. She has published widely on these issues; her most recent papers on legal aid are (with Sanderson, P) ‘Colonising Law for the poor: reconfiguring legal advice in the new regulatory state’ in V. Bryson & P. Fisher (eds) Redefining Social Justice: New Labour Rhetoric and Reality (Manchester, Manchester University Press 2011), and ‘Access to justice and the Big Society: rising need, individual responsibilization and the commercialisation of the voluntary sector’ Journal of Social Work and Family Law (forthcoming). Human trafficking is an increasingly disturbing phenomenon in Europe with terrible consequences for victims, the majority of whom are forced into prostitution, street crime, domestic servitude and other forms of labour exploitation. In order to encourage greater political will, facilitate policy discussion and explore comprehensive and integrated solutions to properly recognise and meet the needs of all victims of human trafficking, Public Policy Exchange is proud to host this annual Symposium and welcomes the participation of all key partners, responsible authorities and stakeholders. The Symposium will support the exchange of ideas and encourage delegates to engage in thought-provoking topical debate. 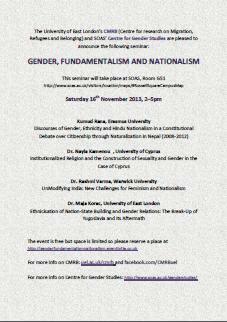 For further details, please refer to the event webpage: http://www.publicpolicyexchange.co.uk/events/DK13-PPE2.php. Do feel free to circulate this information to relevant colleagues within your organisation. In the meantime, to ensure your organisation is represented, please book online (https://book.publicpolicyexchange.co.uk/book.php?event=DK13-PPE2) at your earliest convenience in order to secure your delegate place(s).